In the United States, infestations of the emerald ash borer (EAB) has led to the death and removal of over twenty-five million ash trees. This huge loss has left devastated homeowners, as well as city workers searching for reliable pest and disease resistant shade trees to replace the lost ash trees. Naturally, maple tree sales have increased because not only do they provide good shade but, like ash, they put on spectacular displays of fall color. However, maples oftentimes have problematic surface roots, which make them unsuitable as street or terrace trees. A more suitable option is the Aristocrat pear (Pyrus calleryana ‘Aristocrat’). 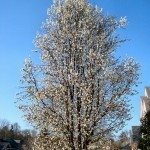 Continue reading to learn more about Aristocrat flowering pear trees. As a landscape designer and garden center worker, I am often asked for suggestions of beautiful shade trees to replace ash trees that were lost to EAB. Usually, my first suggestion is the Callery pear. The Aristocrat Callery pear has been bred for its disease and pest resistance. Unlike its close relative, the Bradford pear, Aristocrat flowering pears do not produce an overabundance of branches and shoots, which is what causes Bradford pears to have unusually weak crotches. The branches of Aristocrat pears are less dense; therefore, they are not as susceptible to wind and ice damage like the Bradford pear. Aristocrat flowering pears also have deeper root structures which, unlike maple roots, do not damage sidewalks, driveways or patios. For this reason, as well as their pollution tolerance, Aristocrat Callery pears are being used frequently in cities as street trees. While the branching of Callery pears is not as dense as Bradford pears, Aristocrat flowering pears grow 30-40 feet (9-12 m.) tall and about 20 feet (6 m.) wide, casting dense shade. Aristocrat flowering pears have pyramidal or oval shaped canopies. In early spring before the foliage appears, Aristocrat pears become covered in white flowers. Then new red-purple leaves emerge. This spring red-purple colored foliage is short lived, though, and soon the foliage becomes glossy green with wavy margins. 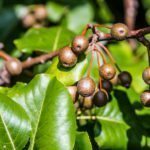 In mid-summer, the tree produces small, pea-size inconspicuous red-brown fruits that attract birds. The fruit persists through fall and winter. In autumn, the glossy green foliage becomes red and yellow. Aristocrat flowering pear trees are hardy in zones 5-9 and will adapt to most soil types, such as clay, loam sand, alkaline and acidic. Its flowers and fruits are beneficial to pollinators and birds, and its dense canopy provides safe nesting sites for our feathered friends. Aristocrat flowering pear trees are labeled as medium to fast growing trees. While little care for Aristocrat flowering pears is needed, regular pruning will improve the overall strength and structure of Aristocrat Callery pear trees. Pruning should be done in winter while the tree is dormant.